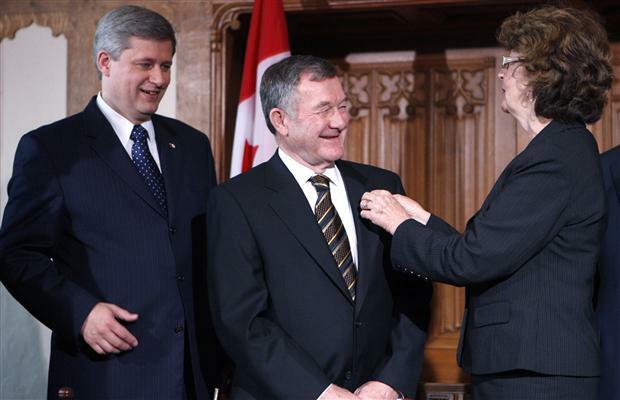 Some of Prime Minister Stephen Harper’s newly-appointed senators are emerging as global-warming skeptics in the wake of aggressive government positions to abandon the Kyoto Protocol, slam environmentalists and downplay potential damage caused by Canadian oil and gas exploration. Environment Canada has told the government that the science overwhelmingly concludes that the Earth is “locked in” to a warmer world, but that it can avoid “dangerous” climate change by scaling back emissions of carbon dioxide and other greenhouse gases that trap heat in the atmosphere. The department’s scientists also say that recently observed evidence of warming falls within the range of predictions made by climate scientists in the past. Brown, jokingly described by the committee chairman, Conservative David Angus as the “resident denier,” is among several members of the Conservative caucus, including elected MPs, such as cabinet minister Maxime Bernier, who have openly suggested climate change scientists from around the world are involved in a conspiracy to exaggerate warnings about the dangerous impacts of fossil-fuel consumption and rising greenhouse gas emissions. Bernier has suggested the government’s reluctance to introduce strong climate-change policies is based on its skepticism of the science. “Every week that goes by confirms the wisdom of our government’s modest position,” wrote Bernier, in a letter before he was invited back into cabinet as junior minister for small business and tourism. Apart from the government’s decision to withdraw from Kyoto, Natural Resources Minister Joe Oliver has slammed environmentalists as “radicals” while touting the virtues of industrial development in the oil and gas industry. But Harper, who once questioned the credibility of scientific evidence linking human activity to global warming, more recently has acknowledged that the science is actually legitimate. “I have said many times that climate change is a great problem for the world,” Harper said, in response to questions about the withdrawal from Kyoto from interim Liberal leader Bob Rae in the House of Commons on Dec. 13. At the same time, Harper is accusing the previous government of signing onto “stupid targets” when it agreed to ratify the Kyoto agreement, while his own government promotes more industrial expansion, without any new regulations to cap pollution. The committee itself decided to give the four skeptics a platform following a request from former Olympic alpine skiing champion, Nancy Greene Raine, another senator appointed by Harper. Andrew Weaver, a Canadian climate scientist at the University of Victoria who publishes research in peer-reviewed journals, noted that the skeptics who appeared at the committee in December were all over the map in terms of making arguments about warming, cooling, warming from the sun, or cosmic rays. “It was like a shotgun of inconsistent arguments,” said Weaver, noting that evidence from research must be proven by science, without opinions involved. Paul Boothe, deputy minister for Environment Canada, has defended scientists in the department, noting they must face a rigorous and challenging process among their international peers, but have still become the largest producer of environmental science in the world, outside of the United States. “They have to defend themselves in the scientific community and they have to be open to all the different kinds of criticisms in order to get their publications in top journals,” Boothe had told the same committee in October. He said they are encouraged to maintain that strong science and their open minds. But Liberal leader Bob Rae isn’t convinced the government is listening to its own scientists.